On Friday Zach and I had our first doctor's appointment. We got to see the baby's heartbeat and hear it. It was so amazing. It of course brought a few tears to both of our eyes. The doc has my due date as Dec. 3rd but the ultrasound tech has me measuring at 7 weeks so is putting our due date a week behind. . .we'll see! Really exciting news. .. Not! 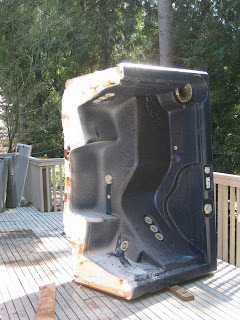 Zach and I finally had the science project of a hot tub removed from our deck. The team came and cut it in half, tossed it over the deck and loaded it on their trailor to take to the dump for us. 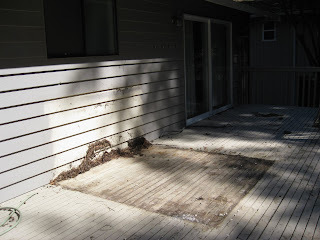 It was disgusting and as you can see we now have a large square on our deck that is not the same color as well as a large square on the house that is not the same color. We definitely have some pressure washing/cleaning to do. We're hoping to put down new wood on the deck that is thicker and NOT painted but stained and then eventually we'll get our entire house painted. For now it stays and we're just glad it's the backside. :) We can't wait to make it pretty and get some nice outdoor furniture for BBQ's and entertaining. The Secrets out. . . I just read Marisa's blog and she mentioned my news so I thought I better update my Blog as well and let everyone know--I'm expecting! I found out the Sunday before my wedding so while many of you may have thought I was drinking at the wedding, I really wasn't. 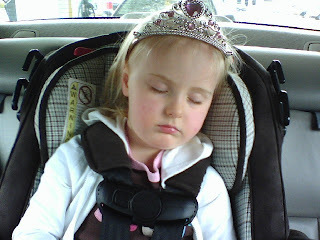 Luckily, I wasn't feeling yucky at that point but shortly after the wedding the nausea kicked in and its been horrible. All I want to do is sleep and be horizontal which is hard for me because I'm used to being active. I'm listening to my body though and just taking it easy for now and my husband is being wonderful taking care of me. :) Our first doctor appointment is next Friday. I'm not sure how far along I am but the first day of my last period was Feb. 26th so if I count from then it puts me at about 49 days --looks like we could have an early December baby--A Christmas Miracle! We were going to try and wait til the 3rd month to spill the beans but Marisa guessed it and Tom pretty much did too and I knew if you all saw me NOT drinking you'd figure it out. . .and BTW, those of you who say that you don't crave the wine when you're pregers--not there yet! Wine still sounds good--well, I guess not when I am feeling sick but for those few minutes in between it does. 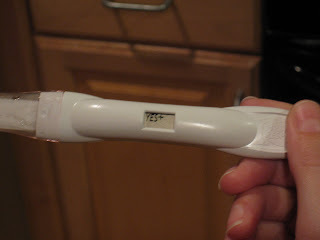 :) So please keep us in your prayers that my pregnancy continues to be a healthy one! I am still in shock. . .but sooooooooo excited! Once again, Z and I have done it a little backwards but I love it. I think I'm ready. . . I think I am pretty much ready for the big day. 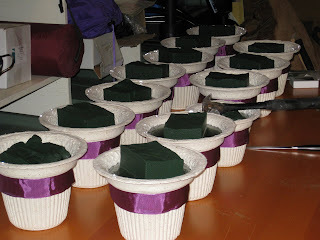 I have all the bridal party gifts wrapped and ready to go. 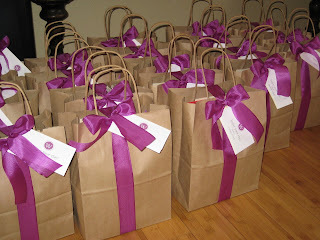 The hotel guest's gift bags are packed and tied with a bow and the vases are in the garage soaking in water waiting for flowers which I will be doing tomorrow (Thursday). Yes, I know I may be crazy for doing my own flowers but I actually enjoy it and florists charge so much so I went to the flower wholesale store and ordered some stuff and will pick it up tomorrow and do the arrangements all day! It's the only thing I have planned tomorrow so it shouldn' t be too bad. Then, Friday is rehearsal and last minute stuff and Saturday is the wedding--I still can't believe it is finally here!!! I'm so excited for the big celebration with our closest family and friends. The top pic are the vases with the green block soaking in water so I can poke the flower stems into it. The bottom pic is of all the goodie bags we are giving to our hotel guests. I just have to wipe down the bathrooms tonight and then I can veg and dream about the big day!